Launched in 2014, to mark the 130th anniversary of Victorinox, I.N.O.X. establishes a new industry standard for watch strength and resilience. The superlative all-terrain watch is now evolving into Victorinox Swiss Army’s core collection—first with blue, black and green models, and now with I.N.O.X. red. I.N.O.X. embodies the quintessential values of Victorinox’s most famous creation, the original Swiss Army Knife: authenticity, strength, quality, Swiss savoir-faire and Swiss design. It pushes these qualities to the extreme by enduring 130 strength tests, a ruthless battery unparalleled in the watch industry. I.N.O.X. will survive, for example, a ten-meter drop onto concrete, temperatures from -57° to + 71° degrees Celsius, attack from all manners of corrosive products, a one-minute exposure to a 1,200° degree Celsius flame, and being driven over by a 64-ton tank. It therefore makes perfect sense for I.N.O.X. 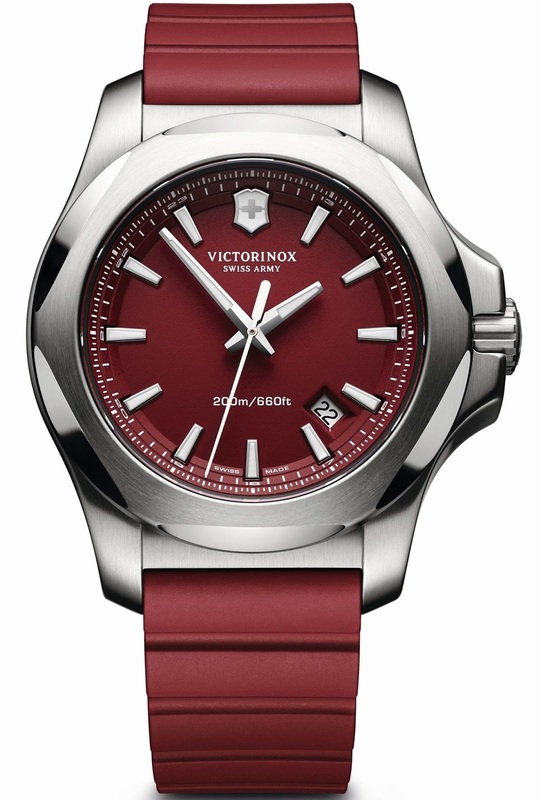 to be launched in Victorinox signature color, the brand to which it pays homage. The shade suits it perfectly. It is also worth noting that in parallel to its robustness, I.N.O.X. cultivates other strengths, including the striking aesthetics of its balanced design. From the test lab to the wrists of stylish men and women the world over, I.N.O.X. makes the transition with ease and elegance. This versatility is accentuated by its “bumper”, a removable protector made of nylon and silicone that enables the wearer to adapt its look to fit any situation. I.N.O.X. red is also subjected to special new tests, in particular those that ensure that its color will not be altered by ultraviolet sunlight.